This month started with another low acid warning! Much like the warning we received for last months theme, the carrot, we were given another ingredient to can that was low on the acid meter, the Allium family. I chose to adapt another recipe from a published source to make sure that I was keeping the acidity at a proper level. My first thought was some sort of Balsamic Onion Confit. I sampled one a while back that was an excellent pairing with a foie gras tourchon and loved its sweet and sour tang. 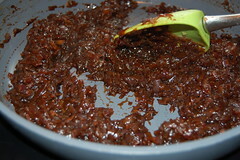 I hit the few books I had and found a quick and small batch recipe for a Caramalized Red Onion Relish. The ingredient list was short and to the point and looked to contain everything I needed to make something that resembled that confit. 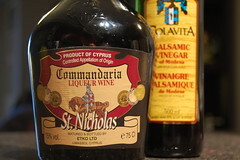 I changed up the basic red wine called for in the recipe for some Commandaria, a desert wine from Cyprus that is similar to a Tawny Port. I figured it would give the balsamic a boost and add another dimension to the flavour. I'm really happy with the end result. A soon as I sampled a taste I immediately thought of running out to get some crusty bread and some sharp aged cheddar for my take on a ploughman's lunch. Combine onions and brown sugar in a heavy non-stick skillet. Cook uncovered over medium-high heat for 25 minutes or until onions turn golden and start to caramelize, stirring frequently. Stir in wine and vinegar. Bring to a boil over high heat, reduce heat to low and cook for about 15 minutes or until most of the liquid evaporated, stirring frequently. 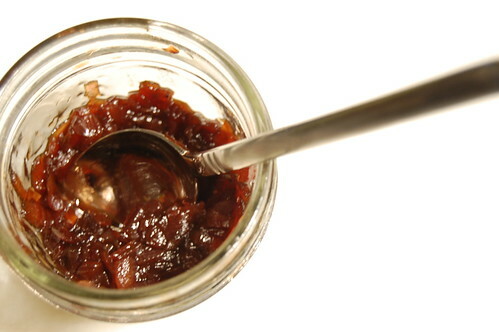 Remove hot jars from canner and spoon relish into jars to within 1/2 inch of rim and process for 10 minutes. I think I may try this at home. Nice job adding the Commandaria. Is it the St. John or the St. Nicholas that you used? Give it a shot! I used the St. Nicholas pictured above. ah. Yes. As they say, a picture is worth a thousand words, or in this case, two words.